This recipe came from my Living magazine, also found here. It’s copied below because I am in no position to be modifying Martha’s recipes! Nor would I want to in this case. I love how it puffs up while it bakes – this would be a really impressive-looking dish to take to a brunch. And the best part is that it tastes as good as it looks. No, the best part is how versatile it is … think of all the different fruit you could use in this! Oliver didn’t like it as much as the rest of us, I think because it tastes ‘eggier’ than a regular pancake. But he’s also not that into trying new things these days so I won’t give up on it and will try it again. Blend together eggs, milk, flour, sugar, lemon zest, and salt in a blender. Heat cast-iron skillet over high heat (I used one 12″ pan but the original recipe split the batter between four smaller ones). Melt butter. Pour in the batter. Scatter the berries over top of the batter. Bake until puffed and cooked through and the tops are set, about 20 minutes for the 12″ pan. 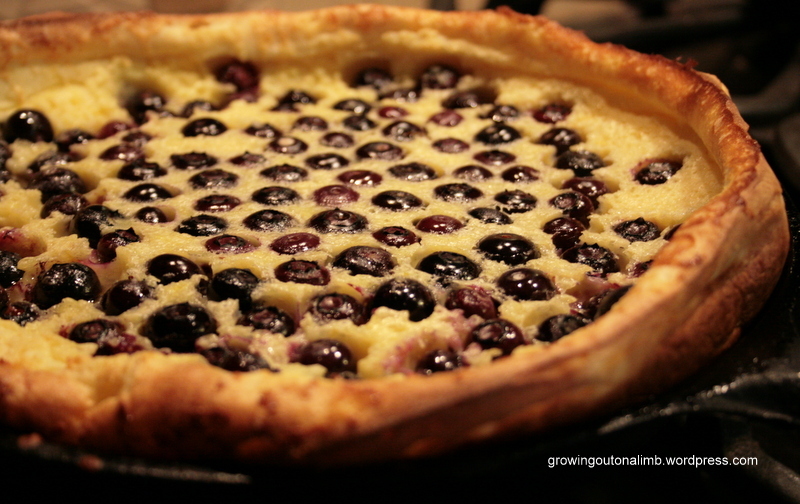 Top with more berries, sprinkle with confectioners’ sugar. Categories: Recipes: Breads & Muffins, Recipes: Oliver-approved | Permalink. A friend gave me a box of homemade goodies last week and these Oreo truffles were in it. They were so delicious that I looked up a recipe right away, saw that they had just three ingredients (three!) and decided to make a batch last minute for our Christmas Eve get together. They are so quick and easy. Oliver could have helped with the sprinkles but he was into something else so I threw them on myself this time. They are really good with the semi-sweet chocolate but next year I’m going to also try white chocolate or milk chocolate. Because I can. And because white chocolate makes everything better! Put the cookies in a food processor and process until they are fine crumbs. Add the block of cream cheese and pulse until combined. Form the mixture into small balls and place on a cookie sheet covered with wax paper. Refrigerate to harden a bit before rolling (30 mins or so). Melt chocolate in a double boiler. 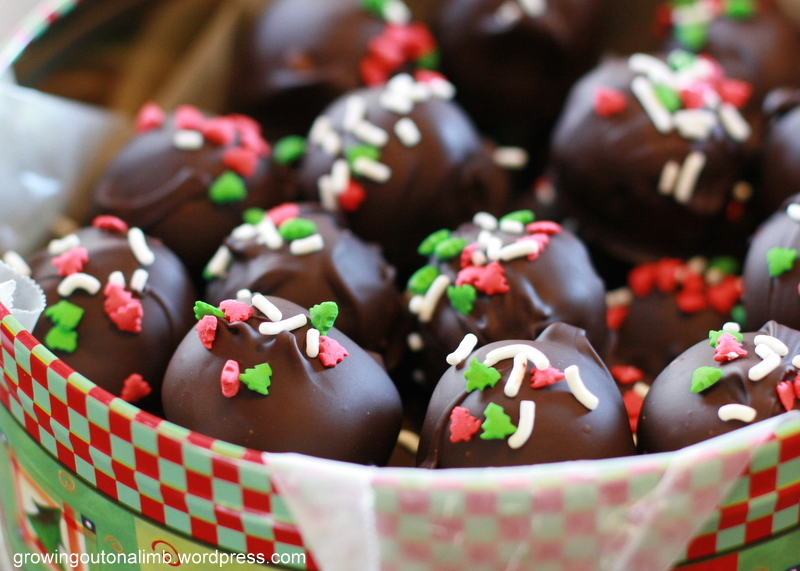 Using two forks, dip each ball into the chocolate and place on another cookie sheet with wax paper. Sprinkle with whatever prettiness you choose. Categories: Holidays, Recipes: Cookies, Recipes: Oliver-approved | Permalink. This is a cookie recipe I’m bringing forward from a (short-lived) blog I used to store recipes at. Brian kisses and curses me all at the same time for this recipe but it really is his favorite (despite the curse words) and it’s a holiday tradition now so I just put up with the grumbling. Funny, he never complains when they’re going in his mouth. The recipe comes fromAllRecipes.com. 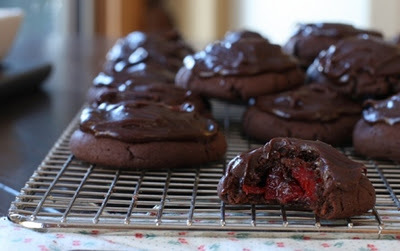 The cookie is just moist and chewy, with the surprise cherry centre. 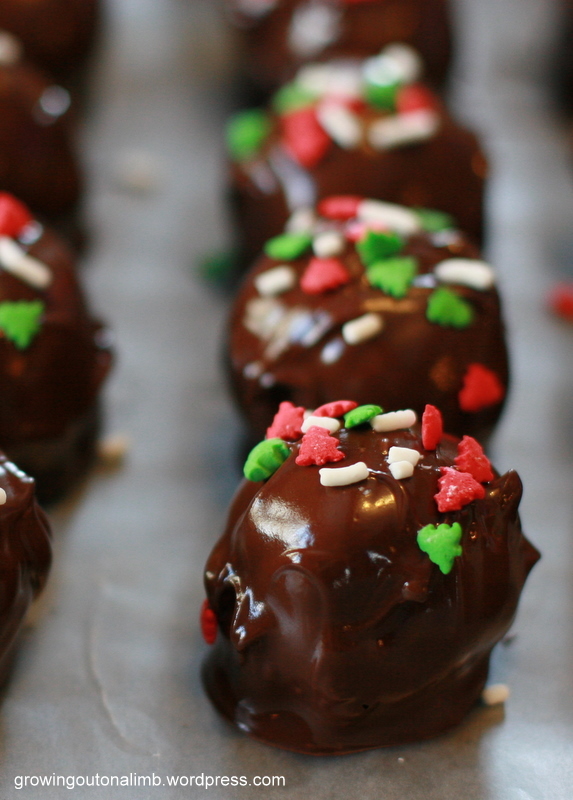 Top it with a rich frosting made of more chocolate and you have a melt-in-your-mouth holiday treat! ~ Cream butter and sugar. Add egg and vanilla; mix well. Combine the flour, cocoa, 1/4 tsp salt, baking powder, and baking soda; gradually add to the creamed mixture. ~ Drain cherries, reserving 1 1/2 tsp of the juice. Pat cherries dry. Shape 1 Tbsp of dough around each cherry (do this rather quickly as the dough tends to dry out). ~ Bake at 350 degrees for 8-10 minutes or until set (don’t overbake). Cool on wire racks. ~ Frosting: In a saucepan, heat chocolate chips and milk until chips are melted (I have also used the microwave, cooking at 15 second intervals until smooth); stir until smooth. Remove from heat. Stir in reserved cherry juice and remaining 1/4 tsp salt. Frost cookies. 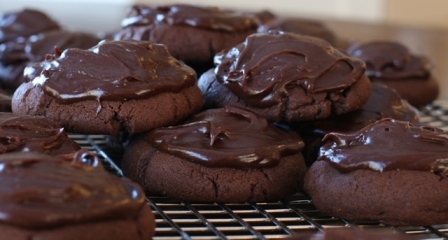 (Some recipes skimp on the frosting but this recipe allows a good amount of frosting on each cookie). Categories: Recipes: Cookies, Recipes: Oliver-approved | Permalink. To my waistline’s chagrine, rainy days often mean making cookies. Oliver is really interested in “helping” me cook lately so a quick batch of cookies is a good way to keep him occupied for 20 minutes or so. We had no chocolate chips in the pantry yesterday so we went with oatmeal raisin. Then, halfway through making the recipe, I realized we didn’t have enough raisins either. Sheesh! So we used a combination of raisins and dried cranberries (and the reason the title is (c)raisin cookies). They are delicious! The original recipe is here but I’ve modified it a bit based on the recipe reviews. Cream together butter, sugars, eggs, and vanilla until smooth. Combine dry ingredients (flour, baking soda, pumpkin pie spice, and salt). Stir into sugar mixture. Stir in the oats and raisins/craisins. Bake 10 to 12 minutes until light and golden. They won’t look done but you don’t want to overbake these… use a spatula to check for a golden bottom. Wait a couple of minutes before moving to a cooling rack. I think we finally have this right. 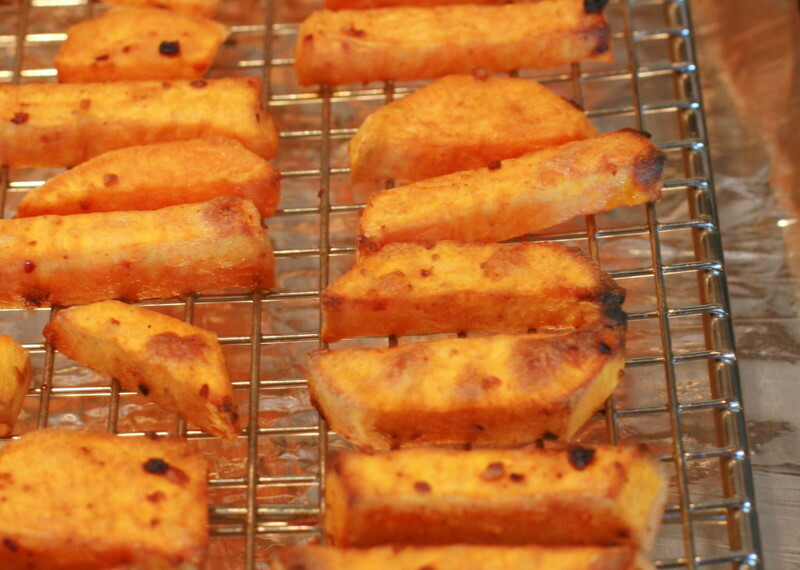 Cooking the best sweet potato fries at home is not about the recipe but about the method. The issue is the flipping – they do fine until you need to turn them or get them off the pan. Suddenly they’re a big mushy mess and don’t finish cooking properly. The solution is a bit more time consuming but definitely worth it: The potatoes are laid out on a cooling rack so they can cook on both sides at the same time (thus no need to flip). That’s it! So simple and obvious that you just want to groan for all the sweet potato mush you’ve eaten before! And there are lots of options for spices. We like a roasted garlic and peppers spice mixture but we’ve also tried chinese five spice. For a sweeter spin, use cinnamon alone or mixed with a bit of sugar. 1. 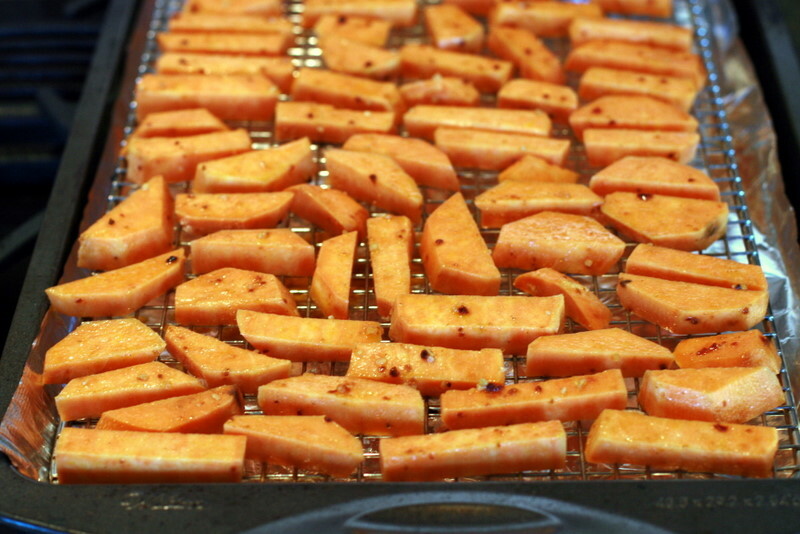 Slice sweet potatoes into fries that are about the same size. 2. Toss potatoes in a bit of vegetable oil, just to coat, and spices. (I like to do this well ahead of time so I’m not rushed at supper. I put everything in a large plastic bag, squish it around, and store in the refrigerator until I’m ready). 3. Cover a baking sheet in foil. Place a metal cooling rack on top. Place the sweet potatoes on the rack so they aren’t touching each other. I can usually fit the fries from two good-sized potatoes on one rack. 4. Bake at 450 degrees until they’re starting to brown and can be pierced with a fork. Categories: Recipes: Oliver-approved, Recipes: Vegetables | Permalink. I found this recipe one night last week when it came upon 4:00 (okay, closer to 4:30) and I still had no idea what I would make for supper. I started opening cupboards and spotted a butternut squash that I had planned to just roast. Why not try a squash soup? 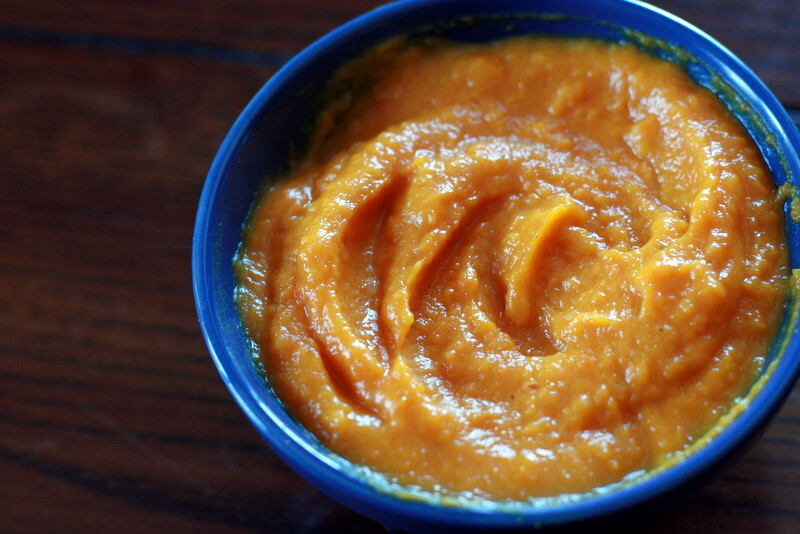 This recipe, found here, is another puree soup. I love that the cinnamon is used in stick form (and that I actually had some). The cinnamon flavor was a bit surprising but not overpowering and made the soup nicely sweet. Even Oliver dipped into it a little bit! Roast butternut squash. (The original recipe has a separate roasted squash recipe that looks really great but I cut into 1-inch cubes, tossed in oil, salt, and pepper, and roasted at 450 degrees until I could pierce it with a fork). Heat olive oil in a large saucepan over medium heat until hot. Add onion, celery, carrot, and cinnamon stick. Saute until soft, about 10 minutes. Season with salt and pepper. Add the stock and coriander. Bring to a boil. Simmer for several minutes. Stir in squash, then simmer gently about 10 minutes, to let the flavors meld. Discard the cinnamon stick. Puree the soup. Reheat gently. Add the half-and-half. Adjust seasoning. Categories: Recipes: Oliver-approved, Recipes: Soups | Permalink.